The UNIDUPDOCK Universal SATA/IDE Dual Hard Drive Duplicator functions as both a convenient solid state (SSD) or hard drive (HDD) copying/imaging solution or an external SATA/IDE SSD or HDD docking station for 2.5in or 3.5in drives (SATA, SATA II, SATA III). Providing quick, yet complete hard drive cloning functionality, this universal dock can operate as a standalone HDD duplicator with no connection to a host computer, delivering an exact 1 to 1 clone of the target hard drive including partition and boot sector information, the Host Protected Area (HPA) as well as user data at a copy rate of 72 MB/sec. 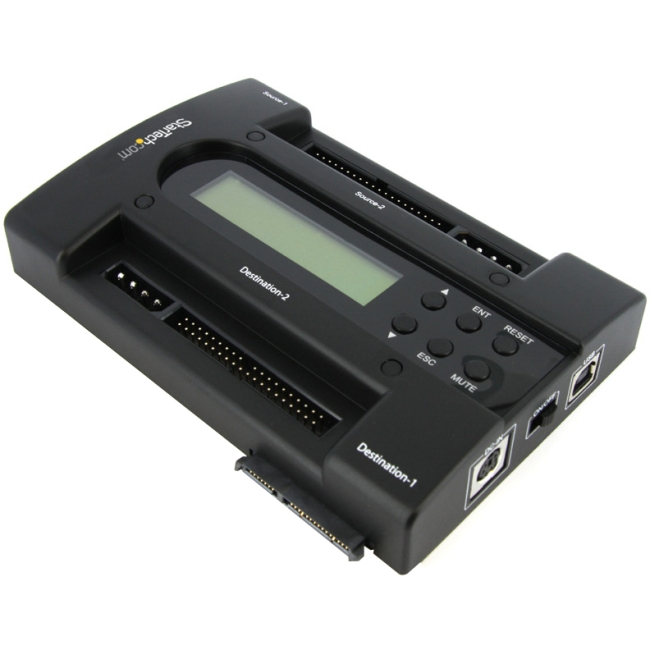 A built in LCD screen then allows for tracking the duplication progress , as well as reporting errors on the drives. Supporting both IDE and SATA, this universal duplicator dock enables duplication from SATA to SATA, IDE to SATA or SATA to IDE, and IDE to IDE, as long as the source drive does not exceed the size of the destination drive. Or the docking station can even be used to quickly erase hard drives, for reuse in the future. Functioning as a universal IDE and SATA HDD docking station, the hard drive duplicator can be connected to a computer through USB with support for simple plug-and-play installation, allowing users to access hard drive contents without having to mount in an external drive enclosure or open the computer case for conventional drive installation. Large capacity drives (tested with up to 4TB 3.5" and 1TB 2.5" drives per bay) can be used to greatly enhance your computer's storage/backup capabilities. Contained in a small form factor design that makes it a suitable addition to desktop and laptop operating environments, this hard drive duplicator/external HDD docking station is a versatile storage and hard drive cloning utility that also features a host of other built in utilities that are accessible via a built in menu system.